Kevin Egan will be the first to tell you, living on North Oak Avenue in Shelton is not a good situation. The road has eroded, pipes are exposed and tree roots and large boulders jut out toward the condos down below. 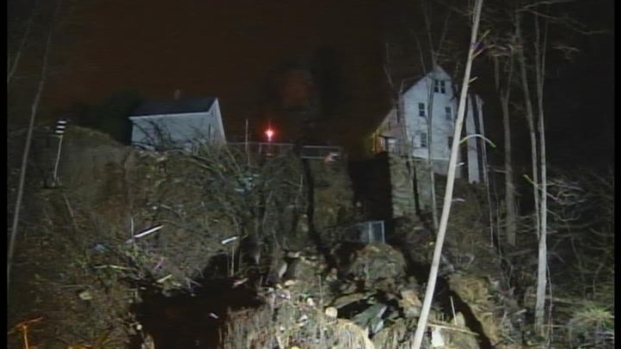 A year and a half ago, a mudslide threatened to send a vacant home down the same steep slope. The town has since demolished the home and cleared the lot, to the tune of $30,000 in taxpayer money. But Egan said things have continued to go downhill, so to speak. A mudslide hit Shelton more than a year ago, and residents are starting to see the ground shifting again. They want the city to do something about it. He and a neighbor called 911 after last week’s rain shifted a few of the rocks from the side of the cliff and he’s worried that more showers will do the same. “The scariest part is, it's going to take someone getting hurt or a vehicle crashing down there before something really happens,” Egan stressed. The fire department determined the boulders weren’t a safety issue, but people on top of the cliff and down below it disagree. Jim Sidoruk, president of the Riverview Condo Association, said repeated calls and e-mails to the mayor are never returned. Condo association leaders said the city is responsible for the cliff, but the city said the land belongs to the condo association. “There's an old saying that you can’t fight city hall. I don’t know what it's going to take. We can’t afford to go after the town legally to do anything,” Sidoruk said. Mayor Mark Lauretti said he intends to call the property owners and discuss possible solutions and told NBC Connecticut that the land is not the city’s responsibility.